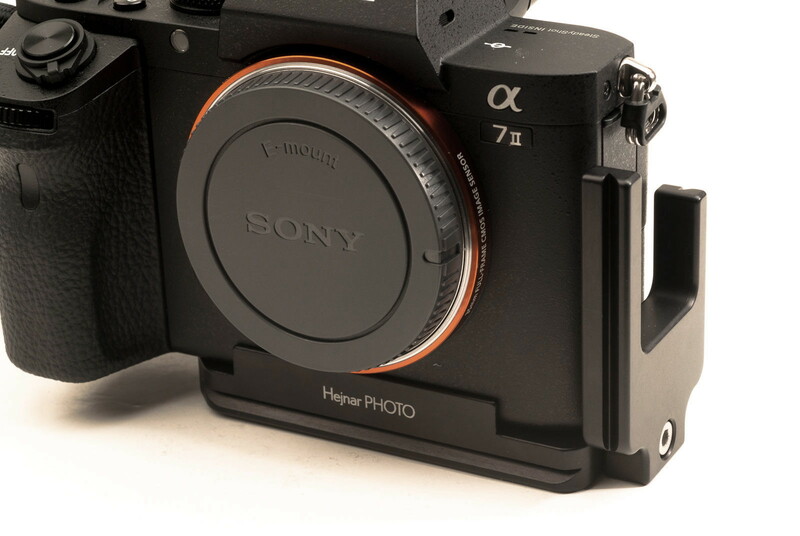 The Hejnar Photo line of Dedicated modular L Brackets for SONY cameras was enriched a couple of days ago with a dedicated L Bracket for the SONY α7ΙΙ Interchangeable Lens Mirrorless Camera. 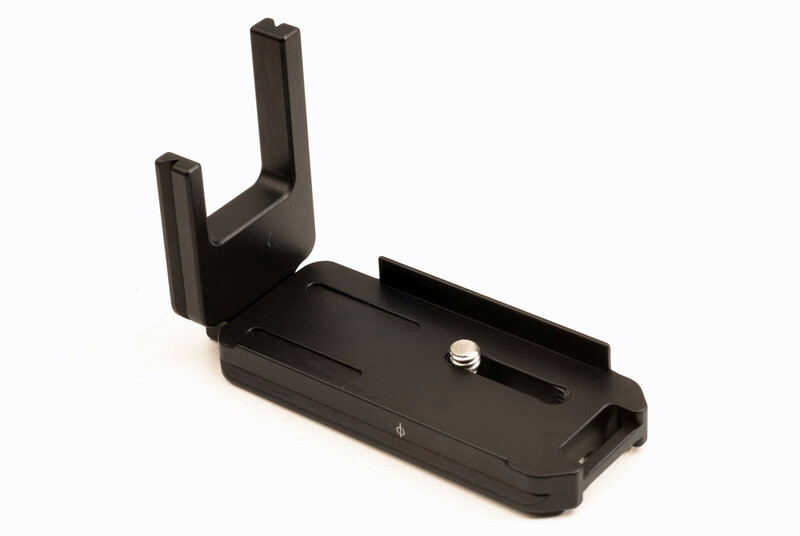 The L Bracket follows the standard 2 part Hejnar Arca-Swiss® compatible modular design, as almost all of Hejnar Photo L Brackets dedicated to the SONY family of mirrorless cameras. For the newcomers, details of the benefits of the modular design are described in the older Modular Hejnar PHOTO Universal Camera L Brackets. 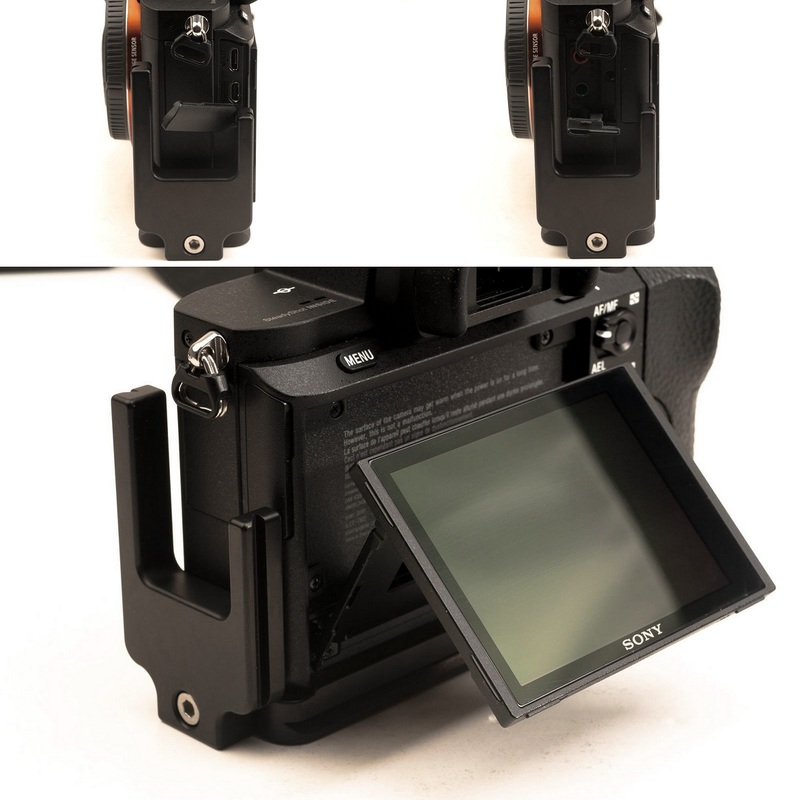 The Hejnar SONY-ALPHA-7II L bracket comes with its two base and side modules pre-assembled. The side plate is quite awkward in shape due to the positioning of the connector doors and the connectors on the side of the camera. The base plate features a larger/taller anti-twist ridge on the front bearing the Hejnar Photo logo. The rear side of the base plate features also a very small/short anti-twist ridge bearing the lens center mark on the horizontal plain. The awkward shape of the vertical/side plate prohibits the existence of a lens center mark on the vertical plain, though. 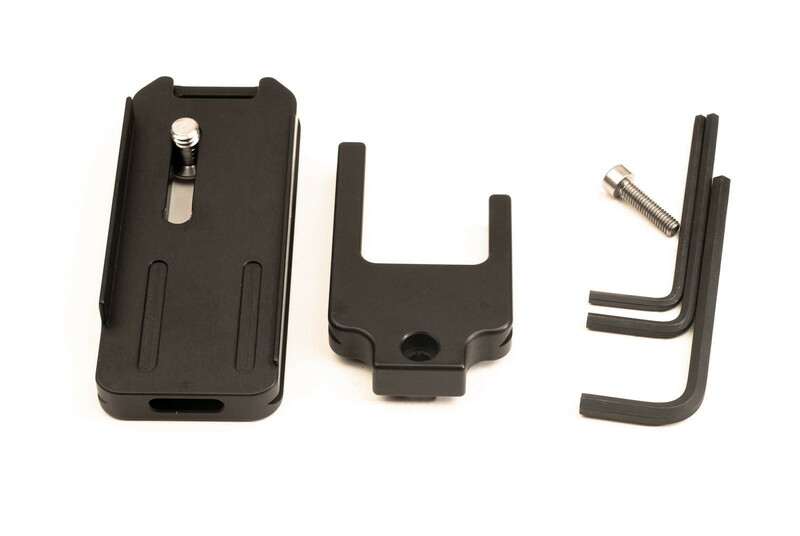 A strap loop for the attachment of a hand strap is also provided on the base plate right end, which is closer to the camera grip. 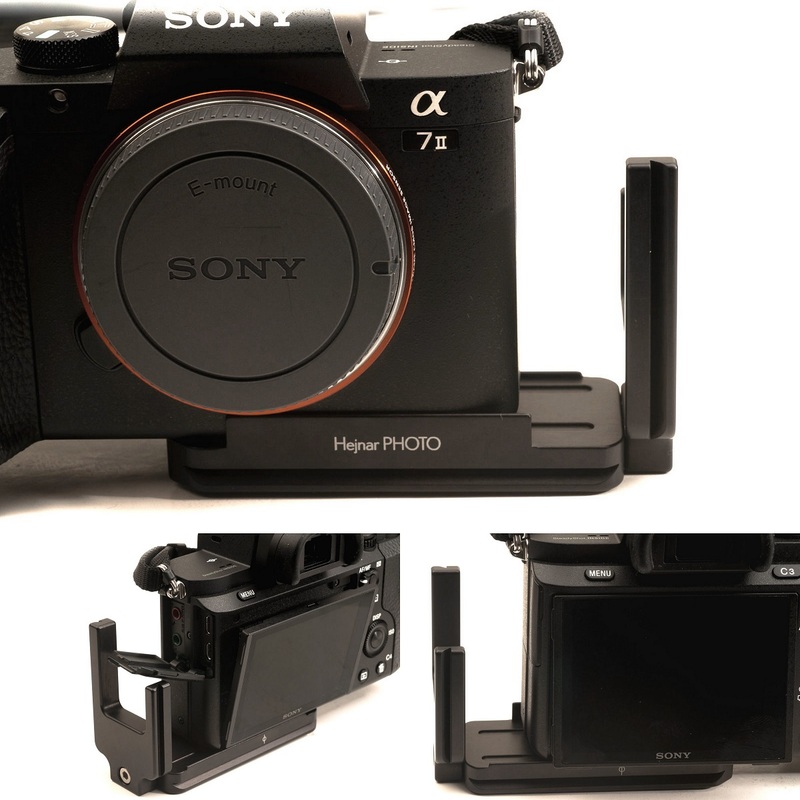 Being modular the Hejnar SONY-ALPHA-7II L bracket is comprised of a Base plate and a Side plate, a fact that enables the removal of the Side plate when not needed and thus be used as a standard Base plate. The captive mounting screw runs in a long captive slot enabling the L bracket to be moved away from the camera side as we shall see further down. The base plate also features an oval groove on the left side within which exists the vertical side mounting hole. The side plate besides the U shape, follows a different alignment method since the usual two SS dowel pins and replaced two bosses aside the mounting hole, which in turn correspond to the groove mentioned above. The bottom of the base plate is hollowed out for weight elimination and is accompanied by one 1/4"-20 captive hex socket screw, one M3 safety stop screw and one long M4 mounting screw. Three Allen hex keys are included in the package; one for the 1/4"-20 camera mounting screw, one for the vertical side mounting screw and one for the base M3 screw. Is evident in the photo above how the front ridge of the base plate fits on the camera body below the lens mount, as a stable anti-twist mechanism. Still, the substantially smaller ridge on the rear of the base plate acts as an additional anti-twist mechanism without interfering with the tilt LCD screen. 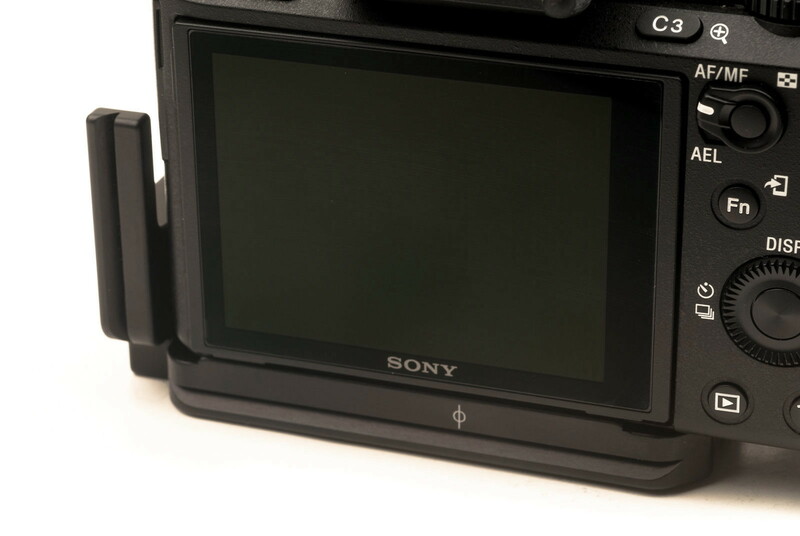 Unlike other Hejnar L brackets the SONY-ALPHA-7II L Bracket, due to its open U shape may fit flush to the camera body allowing the connector doors on the left side of the camera to open fully, thus it allows full access to the camera connectors. Further, with the existence of a larger anti-twist ridge on the front and a comparatively tiny one on the back of the base plate, any interference with the tilting screen is avoided as mentioned before. With the vertical side plate shifted away from the camera side, larger size or longer connector plugs may be used on the side mic, headphone, USB etc connectors for tethered shooting and monitoring even in portrait orientation. The extra distance allows the side doors to open completely without interfering with the vertical side dovetail when clamped. 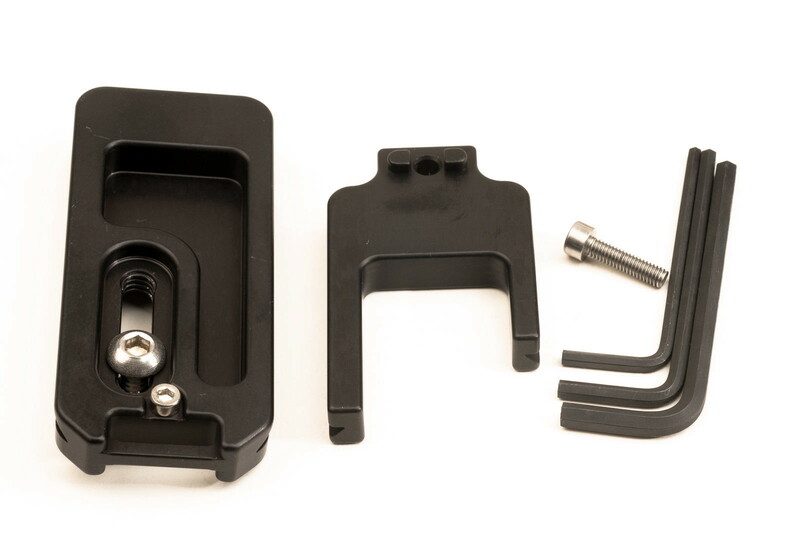 Hejnar Photo dovetail dimensions are compatible with Acratech, Arca-Swiss, Custom Brackets, Foba, Jobu Designs, Kirk, Markins (including lever release clamp), Photo Clam, RRS, Vanguard ABH Series Ball Heads (Arca-Compatible series) and Wimberley QR clamps. Current price for the SONY-ALPHA-7II L Bracket is US$ 90.00 (+Shipping where applicable) and is available from Hejnar Photo Store. 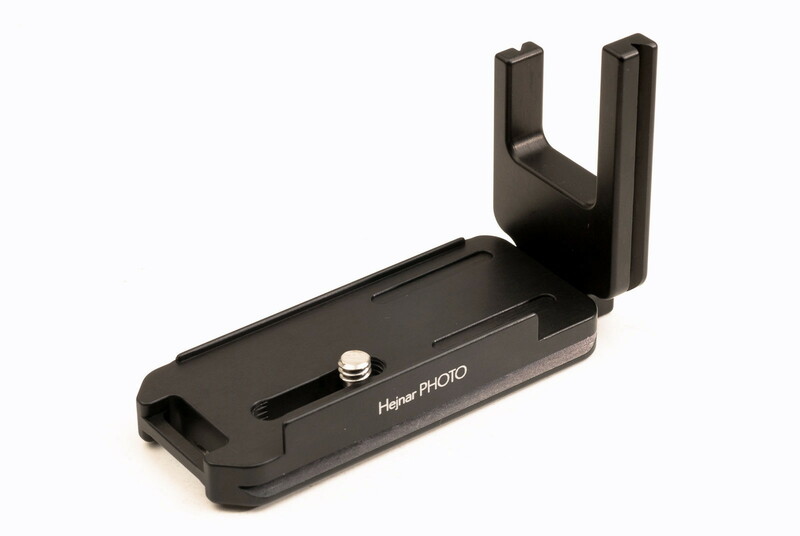 As of 2017 Hejnar Photo Modular L Brackets are no longer available from the Hejnar Photo online Store. Dedicated / Custom camera base plates are available instead.